Huge leaping flames from an exploding gasoline tanker melted the steel underbelly of a highway overpass in the East Bay's MacArthur Maze in the US causing it to collapse onto the roadway below and virtually ensuring major traffic problems for weeks to come. 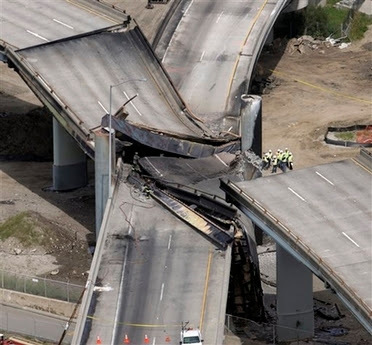 The elevated roadway that fell draped like a blanket over a roadway below that also was severely damaged. The single-vehicle crash occurred on the lower roadway when the tanker, loaded with 8,600 gallons of unleaded gasoline hit a guardrail at 3:41 a.m. Engineers said the green steel frame of the I-580 overpass and the bolts holding the frame together began to melt and bend in the intense heat -- and that movement pulled the roadbed off its supports. California Highway Patrol spokesman Trent Cross said the driver of the tanker, James Mosqueda, 51, of Woodland (Yolo County), was traveling too fast in a 50 mph zone when his truck overturned and burst into flames.